The Shire of Broome, located in the southwest of Kimberley in the far north of Western Australia, is a place with a rich history and unique multicultural mix of people and culture. Over the last decade, the region’s tropical climate, scenic beauty, friendly charm, and casual way of life have attracted rapid and continuous growth, making Broome one of the fastest growing towns in the State. Daniel personally has over 15 years’ experience in urban regeneration, large scape capital projects, placemaking, and labour market and employment services contracting across WA. He worked in several different roles at the Metropolitan Redevelopment Authority, and has been involved in some of WA’s largest urban developments including Elizabeth Quay, Perth City Link, the Midland Workshops, the Perth Cultural Centre Revitalisation, and the William Street Creative Industry Precinct. After working with the Metropolitan Redevelopment Authority for seven years, Daniel took on his role for the Shire of Broome in January 2015. In the time since, he’s used his experience to help combat some economic challenges that resulted from the delay of projects such as the James Price Point gas hub. In the wake of those postponements, the Shire and some other local bodies made it their mission to diversify the economy by focusing harder on industries like irrigated agriculture, aquaculture, and tourism – which is already a huge industry for Broome, but has the potential to be even bigger. “We’re looking at developing all of our industries, not just one industry,” Daniel says. Daniel was eager to take on that challenge because of his attraction to the area. He saw Broome as a “unique, exciting, and kind-of romantic location,” one that he was eager to explore both personally and professionally. Broome also has a fascinating heritage that dates back over 100 years, when the town was a world leader in the pearling trade and began its multicultural tradition. “It was a multicultural town before the term multiculturalism was even invented,” Daniel says. The same qualities that attracted Daniel have consistently attracted others to the region as well – everyone from backpackers, to families and retirees, to artists and millionaires. No matter whom they are or what background they come from, people in Broome’s community recognise the value placed on a great lifestyle in a pristine and colourful environment. 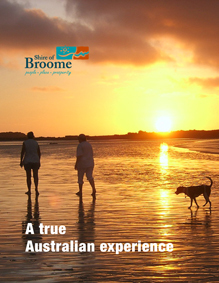 The Shire of Broome is an internationally-recognised tourism destination. Not only is the town on the doorstep of the Indian Ocean, but it’s also home to “one of the world’s last great wildernesses” – which is a combination that’s hard to resist. Broome also has an exotic history as a pearling town, and honours that history by hosting some of the world’s finest pearl showrooms. That fact – when combined with the area’s pristine waters, wide empty beaches, abundant wildlife, tropical climate and breathtaking colours – attracts thousands of visitors each year. The area is also home to the world-famous pure-white sands of Cable Beach, where visitors can go on camel rides across the sand. That attraction alone makes Broome one of Western Australia’s most popular holiday resort destinations. On top of that, Broome boasts a long list of things to do and see, including the 130 million year old dinosaur footprints at Gantheaume Point, the lively Courthouse Markets on Saturday mornings, the natural phenomenon of the Staircase to the Moon, guided tours into the history of Broome’s pearling history, the Broome Bird Observatory, and the Willie Creek Pearl Farm – the only pearl farm in the Kimberley that is open to the public. In the Dampier Peninsula – which has a rich heritage of Aboriginal culture – visitors also have the option to tour with local Aboriginal guides to “sample bush food, catch mud crabs, and learn the local craft of spear-making,” Daniel says. When it comes to finding a place to stay, Broome offers visitors plenty of options. The area has a growing caravan and campervan market, for example, with six large caravan sites. It is also home to 25 hotels with 1,500 rooms between them, which cater to all budgets. In recent years, the Shire of Broome has also concentrated on developing their cruise ship markets. Daniel estimates that business contributed $4 million to the local economy in the 2014-2015 financial year. To grow that number, Council recently invested $25,000 into the Chamber of Commerce and the Broome Visitor Centre to set up visitor services for cruise ship passengers. Even more, the Shire of Broome helps to encourage tourism through a ‘Tourism Administration Policy.’ In the last financial year Council contributed about $315,000 of support to tourism organisations such as the Broome Visitor Centre, the recently-formed Broome Tourism Leadership Group, and Australia’s North West – which is a regional tourism association for the Kimberley and Pilbara regions of WA. The support doesn’t stop there. Broome plays host to an active calendar of events throughout the year, and Council provides roughly $275,000 annually to support that calendar. Those funds support events including Cable Beach Polo, Australia Day Fireworks & Family Fun Day, and the monthly Staircase to the Moon markets at Town Beach, where tourists can witness the spectacular natural phenomenon which occurs when a full moon rises over the exposed tidal flats at Roebuck Bay. The Shire of Broome also supports ‘Shinju Matsuri: Festival of the Pearl,’ an internationally-recognised and longstanding multicultural festival that celebrates Broome’s history with events showcasing visiting cultural performers and special guests, as well as local performing artists and visual artists. 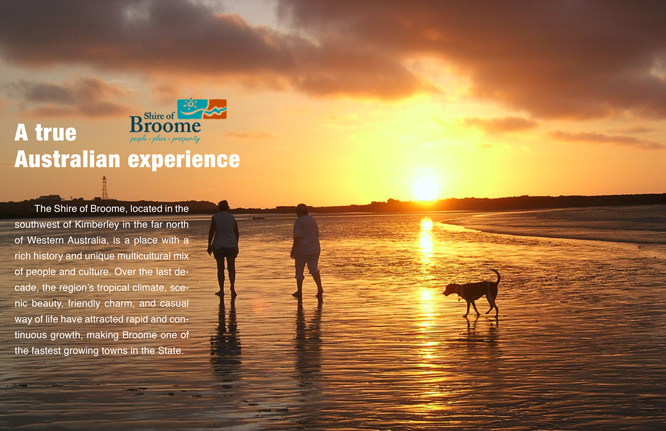 Broome is more than just a destination for tourism. As proven by its rapidly growing population, the region is also fast becoming the destination of choice for industry and commerce, and is being recognised as a great place to live and raise a family. In particular, Daniel says that Council is excited about the future of irrigated agriculture. The Western Australian Government recently released a 650 hectare block of land about 23 kilometres from the city. That land – known as the Skuthorpe block – has huge potential for irrigated agriculture and could be a big employer for the town. It’s also close to major transport infrastructure, making it highly appealing to investors. Some operators are already growing crops such as pumpkins and asparagus at Skuthorpe, but there is an opportunity to do more, such as irrigated agriculture to increase beef production. That will give Broome the chance to capitalise on the demand for food and meat that will come out of the rising China and Asian middle class. Another developing industry that the Shire is excited about is aquaculture, Daniel adds. The Kimberley Aquaculture Development Zone was recently created in Cone Bay, across from the Dampier Peninsula, about 215 kilometres north-east of the town. That area is a proven location for the culture of barramundi. The tidal influence there creates substantial water flow through the sea-cages in which the fish are grown, allowing for a high level of productivity with a low environmental impact. The state of WA is also putting $10 million into the revitalisation of Broome’s historic Chinatown precinct – with the Shire having contributed $2 million, and set to contribute $600,000 more. That’s a significant urban regeneration project, and is being delivered in partnership with the Kimberley Development Commission and Landcorp. In a recent development, the Shire of Broome has been selected as one of four regional growth centres as part of WA’s Regional Centres Development Plan. Broome – along with Greater Bunburry, Geraldton, and Kalgoorlie – will share $7.5 million in stage one to work with the WA Government to plan future economic growth. “We’re proud that the state government has recognised us as a gateway to the Kimberley, and recognised that we can generate a lot of economic and social outcomes for our entire region,” Daniel says. On a more local level, Daniel reports that the area has recently seen the opening of Yeeda Abattoir, Western Australia’s first abattoir in 22 years. He predicts that development is a sign of things to come in the soon-to-be-booming agricultural space. Daniel also cites the Kimberley Regional Offices Redevelopment as a good sign for the future. Those are owned by the Shire, but occupied by a range of government and non-government agencies. They are being redeveloped as a new 12,000 square metre office building valued at $6.4 million. That project is estimated to ultimately deliver 82 jobs, and a further 33 indirect support positions. The Shire of Broome is also undergoing a $3.3 million upgrade of its Recreation & Aquatic Centre, which is a popular amenity for the Broome community. That upgrade will be jointly funded through the Department of Sport and Recreation, developer contributions and the Shire. It will include an overhaul to the plant and water treatment systems as well as a much needed facelift to the pool concourse and lining. Finally, the Shire recently completed the first stage of work on the Jetty to Jetty Project, which aims to create a heritage walk trail linking Streeter’s Jetty in Chinatown and the site of Broome’s old jetty at Town Beach. That walk trail will utilise existing footpaths and highlight at least 13 historic locations along the route, with interpretive signage featuring historical photographs and quotes from senior Broome figures installed at each stop. Moving forward, Daniel says that ongoing development will not slow down – especially when it comes to cultural, culinary, and nature-based tourism products. More than that, he says the Shire of Broome has the potential to be a transport hub that can service the developing onshore and offshore oil and gas industries. In the future, the Shire aims to maximise that potential. Plus, as the gateway to the Kimberley region, Broome is already a regional health centre, with many providers and facilities choosing it as a base of operations. Daniel says the Shire will continue to maintain and build on that function as time goes on and the population grows. At the same time, to accommodate that rapidly growing population, the Shire will also continue to provide a high availability of industrial and residential land.